﻿ Fort Recovery State Museum - Ohio. Find It Here. Visitors to Fort Recovery see history come alive through the reconstructed fort with two-story blockhouses and connecting stockade. 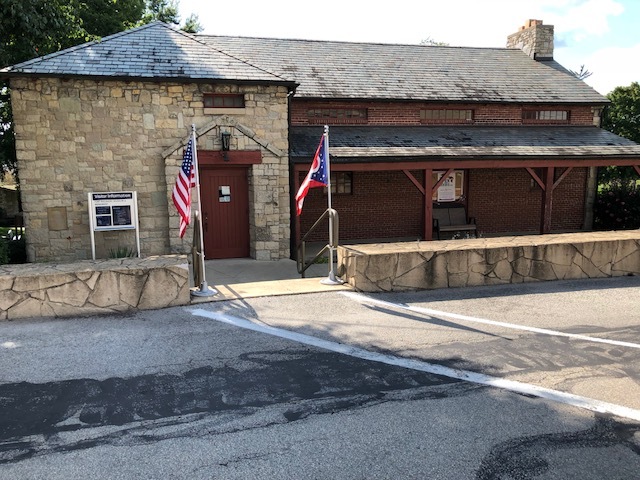 The adjacent museum (1938 WPA project) houses accurate figures of Wayne’s Legion. Also of interest, Native American history, models and artifacts, all of which tell stories of those proud people. Fort Recovery Monument Park features an obelisk,105 feet tall, in honor of soldiers who died in both battles, and whose remains are buried in a crypt within. Other Fort Recovery Sites include: 1. Museum upstairs: prehistoric artifact exhibit & flintknapping video 2. Museum Basement – Dragoon w/horse, historic battle artifacts /exhibits 3. Walk-By Museum - Fort Recovery Historical Society 4. Red-Haired Nance Statue – only civilian survivor of St. Clair Battle. Fought with baby in arms/ wielding a frying pan 5. Fort Recovery Monument – 101 foot tall obelisk - burial site for the fallen soldiers of 1791, '94. Scout statue symbolically on west side facing "highway west" - The Wabash! 6. Pioneer Cemetery – Oldest Cemetery in county 7. Butler’s Plaque – Where General Richard Butler died under a tree during the St. Clair Massacre. (highest ranking officer ever to die on a battlefield.) 8. Indian Memorial – Honoring tribes which signed the Greenville Treaty 9. Wabash River Source – St. Rt. 49, 4 miles south 10. 5 Historic Murals Author/Historian, John Winkler,"The Wabash Battle of 1791 a watershed moment in American History"